We are a rigid and renowned name in the field of bringing to the clients a range of Copper Mining Equipment that mainly used in exploration, drilling, geothermal industries. Since we are strategically Located, our reach is far accessible to various places and hence quick delivery can be made to our clients. We offer Copper Mining Equipment that are featured with temperature shoots as fast as never before, with a very small and handy, low electrical consumption. These pieces of equipment assure low maintenance cost, easy to use and for the process of copper mining where the crushed copper ore is finely ground, then concentrated, smelted and refined. We make the use of a variation of the cost-effective block cave mining technique in its underground operations. 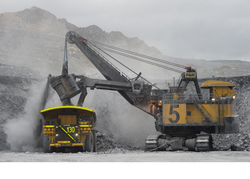 Looking for Copper Mining Equipment ?